The decision to begin therapy usually has a backdrop that can include stress, unhappiness, unfilled hopes and interpersonal difficulties. 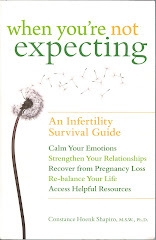 If infertility is at the source of the stress, there may be additional components: fertile friends and siblings; juggling employment and treatment; monthly feelings of failure; difficulty communicating (verbally and sexually) with your partner and, perhaps, the experience of mourning one or more pregnancy losses. Finding a therapist who can be helpful along all of these dimensions can feel like a huge challenge. So, in the spirit of good problem-solving, let's see how we can approach this creatively. I am writing this particular blog now, because in my December 31st blog heralding the beginning of the new year I cautioned all readers to take care of themselves emotionally. For some this will mean gathering comfort from friends and family, and for others it could mean seeking a therapist who can help you feel empowered by sorting through the various components of your emotional distress. In my recent book When You're Not Expecting, I devote an entire chapter ("Another Shoulder to Lean On") to finding emotional sources of support. Today's blog will focus on finding a therapist. If you are beginning this search already in the throes of emotional misery, be aware that you may need to expect some delays as you identify a therapist who feels like a good choice. The therapist may have a waiting list, may not be covered by your insurance, may have a schedule that conflicts with yours, or may have an office that requires more travel than is ideal. So let's begin with how you can initiate your search. Most of my clients and infertile acquaintances have found that word-of-mouth in their own community often serves them very well. Good therapists acquire good reputations for all the right reasons, and your initial inquiry should include whether or not the recommended therapist has experience counseling infertile clients. Someone with this background is ideal, since s/he will probably be familiar with treatments, side effects, parenting options and resources, and will save you the time of explaining your infertility issues in much detail. If you are currently being seen at an infertility clinic, be sure to ask whether the clinic employs a mental health professional for its patients. But if infertility is not a familiar issue for a recommended therapist in your community, don't despair. Here are some of the most important areas of expertise for a therapist: couple communication, grief counseling, family dynamics, depression and decision-making. Those areas are ones in which many couples with infertility need help, and along the way you can educate the therapist about the particular aspects of your infertility that are important. So let's imagine that trusted friends, infertile acquaintances and family have not come through for you with names of therapists to consider. Some other resources could include your county Mental Health Association, the social worker at your local hospital, a local RESOLVE representative, your ob-gyn, a mental health specialist at a nearby fertility clinic or your religious leader. You also can contact RESOLVE (the national infertility association) at http://www.resolve.org/ for names of therapists and leaders of support groups in your area. You are likely to be given names of social workers, psychologists, pastoral counselors and marriage and family therapists from these resources. Once you have several names, it will be up to you to contact the therapist and ask for an appointment. What barriers might you encounter? You should expect the therapist to ask that you and your partner both attend the first meeting, so be sure to have two datebooks in front of you when you have this first conversation. You will be asked to describe your situation briefly, so be prepared to do this, and to ask the therapist whether s/he works with clients using the areas of expertise I mentioned above. If your prospective therapist has a full caseload of clients and offers to put you on a waiting list, you should ask how long it is likely to be before you could be seen (or, better yet, ask whether you could be fit in for an introductory appointment so you at least can determine whether you feel comfortable in conversations with this particular therapist). If the wait seems too long, or if a visit reveals that the chemistry is just not right, ask the therapist to suggest names of other therapists in the community. This process can take a while, but it is time well spent. Another potential barrier is insurance coverage for the therapist's services. Find out in your initial telephone conversation with your own health insurance carrier what therapists are covered, and begin by contacting them. But if you find, for whatever reasons, that insurance is a problem, you have several options. One option is to ask to be seen by a therapist at your local mental health clinic or at your local family counseling agency (both may have sliding fee scales). Some therapists in private practice also have sliding fee scales. Another option is to look carefully at your savings and decide whether you can afford to pay out of pocket for these expenses. A last option is to seek a financial gift or an interest free loan from loving family members. In terms of therapists whose schedules are a challenge or whose offices are difficult to reach, those issues are likely to be ones where you will need to adjust your life once you have decided that seeking therapy is an important priority. You can request a more convenient time if one becomes available, but the inconvenience of distance is a challenge. Occasionally a therapist might be open to a Skype session or a conference telephone call, but this is likely to be the exception rather than the rule. So, the take-away message of this blog is that finding a therapist can take time and energy, but there are very clear pathways to follow in this quest for emotional support. And with this emotional support, hopefully you and your partner will feel increasingly energized and resilient as you face together the months ahead.